Golisi S4 4-Bay Battery Charger $19.99 (USA) - Daily Vaping Deals & The Best Vape Product Reviews at Vaping Cheap! For a limited time only, the Golisi S4 4-Bay Battery Charger is now on sale right here for only $19.99! No coupon code required! 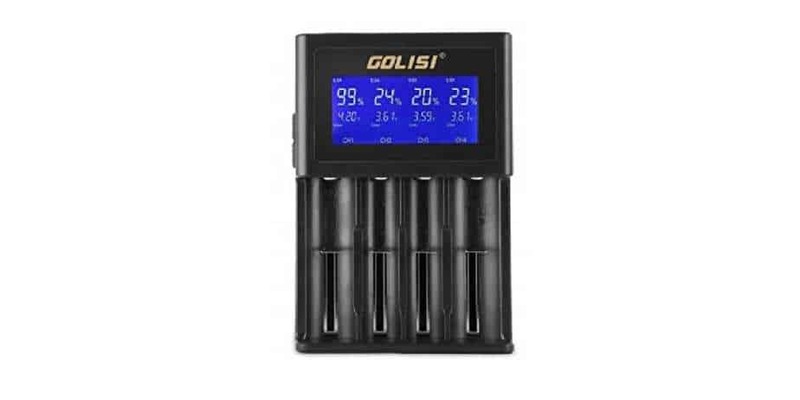 The Golisi S4 4-Bay Charger can charge up to 4 batteries at a time and is compatible with various sizes including 18650, 20700, 21700 and 26650. In addition, this charger has a charging output of 2A, allowing you to charge your batteries incredibly quick! The Golisi S4 4-bay Charger is constructed out of high quality fire proof material and features a military grade loading spring with a 100k life cycle. Not to mention, this charger also can charge other devices utilizing the USB port. The Gosisi S4 4-Bay Charger features a automatic identification of your batteries. Furthermore, this battery charger features simultaneous and synchronized charging! Lastly, the Golisi S4 4-Bay Battery Charger features a large HD LCD screen and has many safety features built in, ensuring a peace of mind while charging your batteries! All in all, this is a excellent deal for the Golisi S4 4-Bay Charger! If you’re looking for a new 4 Bay battery charger that can charge up to 2A, then this is a deal you cannot miss! Make sure to check out this deal at VapeWild for only $19.99!